I’m a bit of a latecomer I admit, but I’ve recently become a Twitter fanatic and can’t get enough of the tool. I was thinking though - would Twitter influence my decision to purchase a holiday? Would Facebook carry more weight? What about other social channels? 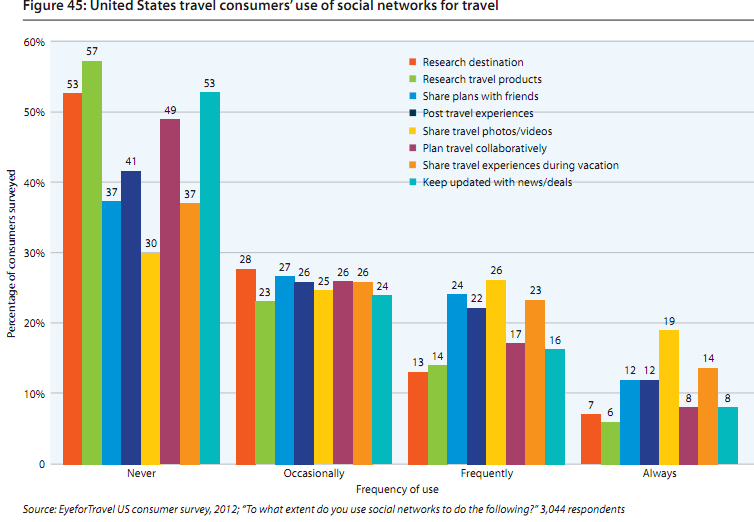 Travel Reviews on Social Media sites have been proven to create a direct increase in bookings for travel brands. But how significant is the role of Social Media in the research process? I decided to do some reading around the topic. EyeforTravel’s Travel Consumer Report 2012-2013 shows that social networks are more valuable for reviews (rather than selling products) and that when it comes to actually making the booking, “respondents currently do not use social networks to research travel products or destinations”. So, actually how important is Social Media to your overall brand? Do we over-hype it in the wrong areas and what is the best way to integrate it perfectly into our marketing strategy? To learn more about the value of Social Media and how to use it in the most effective way for your brand, make sure you check out the 9th Annual Travel Distribution Summit, Asia (28-29th May, Singapore) where Twitter, World Hotels, Google, LinkedIn, Facebook, Flight Centre, Emirates, Japan Airlines, Starwood Hotels, Malaysia Airlines, Groupon and more - will all be presenting their views on this theme.